A new study has found 57% of UK drivers now attempt some repairs and maintenance on their cars in a bid to save money and time – but when it comes to service and repair, it’s best to let a skilled professional help you get the most out of your vehicle. Although motor maintenance used to be a Sunday morning pastime, developments in vehicle technology over the last few years means that cars have become increasingly complex and this kind of home maintenance is no longer practical, safe or even cost-effective. By using a trained vehicle technician you’re ensuring quality and safety, so check out why it’s best to Trust My Garage below! Why do motorists want to DIY their vehicle repairs? Most of the reasons provided reflect a lack of trust in garages as motorists face a bewildering variety of choices in garage services and it can be hard to determine how to ensure quality of service at the right price. With Trust My Garage the answer is in front of you! We want to ensure that any motorist can find a trusted local garage for all repairs – whether simple or complex – in the certain knowledge that the price will be right for the work involved. But will DIY-ing it save you money? When asked if their DIY repairs fixed the problems they’ve encountered, 62% said it had. However, of the remaining 38%, two-thirds of respondents admitted they often pay more between £80 and £170 to rectify the work they have attempted themselves. The top repairs attempted before being taken into a garage to be sorted were ‘knocking out a dent’ (17%), painting an area of the car’ (15%) and ‘fixing a head gasket’ (12%). Of course, if a motorist feels comfortable with repairing minor issues such as changing a headlamp bulb or windscreen wiper then it could save them money – but with larger repairs and replacements, it’s vital to let a trained technician work on a vehicle to ensure any work is conducted safely, thoroughly and to a high standard of workmanship. How does Trust My Garage benefit drivers? By visiting a Trust My Garage member, you can get a fixed quote or estimate, both of which are inclusive of parts, labour and VAT – so you know how much your repair will cost before any work is completed. On top of that, our members promise to only charge for any work completed, and any parts that are supplied and fitted to the vehicle. If you want to read more information, you can check out our Code of Practice here. By using a TMG-approved member, you’re visiting a garage that adheres to a CTSI (Chartered Trading Standards Institute)-approved Code of Conduct. Our code means that you and your vehicle get the best service possible, no matter which TMG member you visit – so there’s no need to worry about doing it yourself when excellent service is on your doorstep! Although wanting to save money is an understandable premise, vehicles are complicated pieces of machinery and it’s always best to let a trained technician do their job – after all, they understand the ins and out of the vehicles that drive on to their premises. 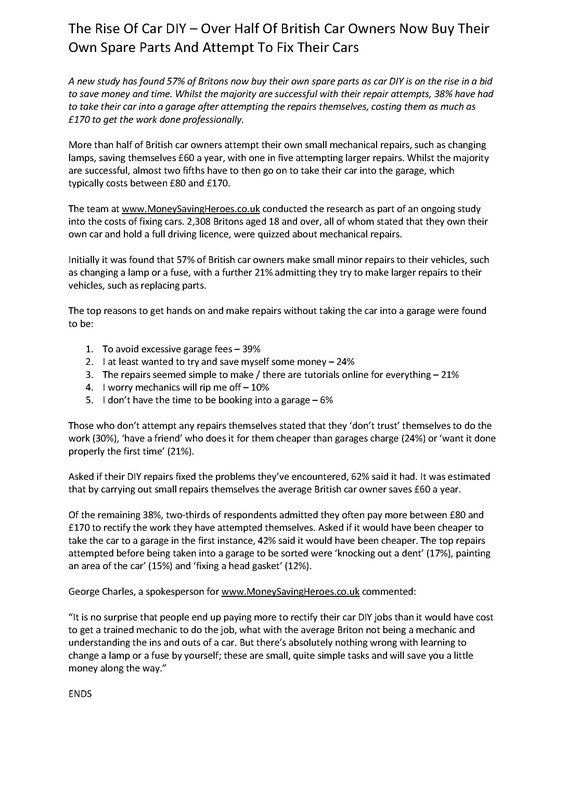 As well as this, the study shows that it’s a strong possibility you could end up paying even more to rectify a DIY error, so you could be out of pocket and still be left with a problem on your vehicle. If you’re attempting a larger repair, it could even leave your motor in an unsafe state. All the garages in Trust My Garage are members of the Independent Garage Association which is part of the RMI, one of Britain’s oldest motor trade organisations. IGA members are true professionals who must comply with a strict code of practice, so every customer of all Trust My Garage members can rely on using a nationally recognised brand to help you and your vehicle get the best value service for your money. Visit TrustMyGarage.co.uk for more information – and be sure to check out our Facebook, Twitter and YouTube pages too!